In this day and age, it seems everything online has a price associated with it. Whether you’re subscribing to a pay site for full articles or clicking on ads in a blog, everything online seems to have money associated with it. Luckily there’s still a large, and very healthy, movement online for media files listed under the Creative Commons licenses. For those of you unfamiliar with the concept, these are files you can use in the creation of web sites and other media, free of charge. However, do be mindful that there are different degrees of the license, and some of them are for private use only, or they may require that you include an attribution to the original creator. Make sure to read and understand the various licenses, and which one each file you discover uses. 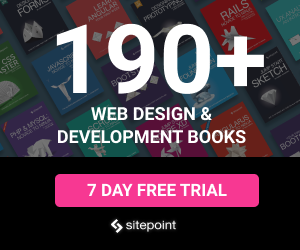 When this article was first published in 2009, SitePoint had gathered over 30 of the best resources online for audio, video, images and more for use in your next project. 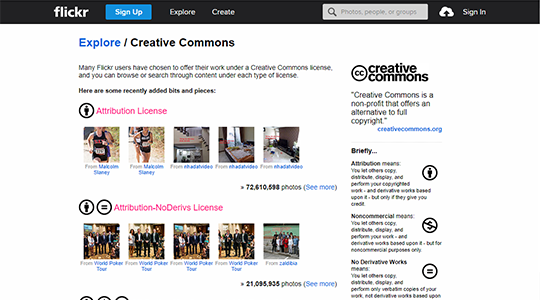 As the years have passed, the Creative Commons movement has gained a lot of momentum. While a few of the sites in the initial list have gone silent, the new updated list boasts a much larger number of new entries. How large? Too large to go into full details for each entry. That’s why we will highlight, for each section, five websites we find most interesting, while the rest of the entries will follow in alphabetical order. All this being said, it’s time to get things rolling. Free audio clips and songs essentially have a limitless number of uses, from playing in the background of videocasts, to being the opening theme to a podcast, or even just being used as a sound effect when users click on a link. Of all the resources out there, Creative Commons licensed music has the most potential uses for content creators and designers alike. The spread of media creation on YouTube, Vimeo and other platforms has raised the demand for quality audio clips that can be used by small content creators without losing the option to monetize their content. It’s no surprise these kinds of resources are very popular. The large number of new entries on our list proves it. 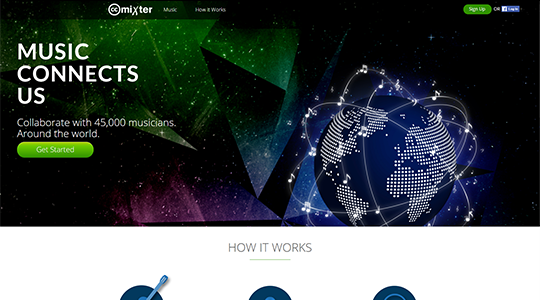 ccMixter offers up thousands of Creative Commons licensed remixed songs in just about every genre available. Make sure to read each track’s info page to see just which version of the license it follows. 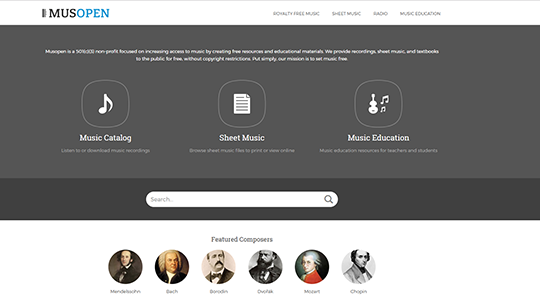 MusOpen is the online repository for music in the public domain. The vast majority of the tracks are classic music with all the famous composers present in the lineup. There’s also a large collection of sheet music, as well as numerous music education resources. 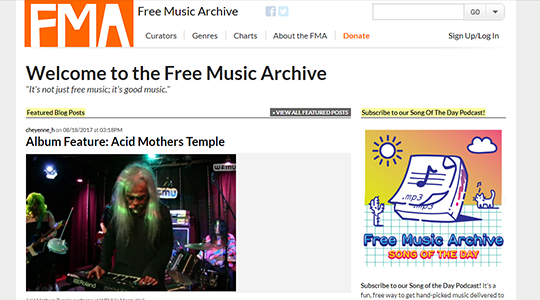 The Free Music Archive is an interactive library of high-quality, legal audio downloads where all of the audio has been hand-picked by one of their established audio curators. Every MP3 you discover on The Free Music Archive is pre-cleared for certain types of uses that would otherwise be prohibited by copyright laws not designed for the digital era. 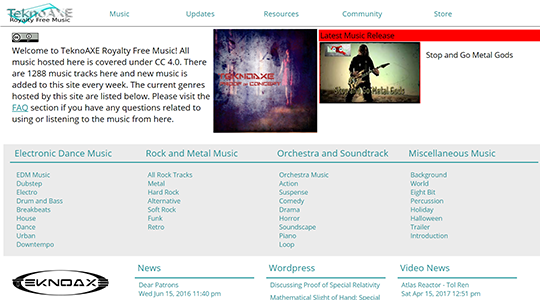 TeknoAXE hosts a very large collection of music (over 1200), with new pieces added every week. All songs are distributed under CC 4.0 license and are free to use everywhere as long as one posts the attribution info. Siverman Sound Studios is the place where musician Shane Ivers shares his music. 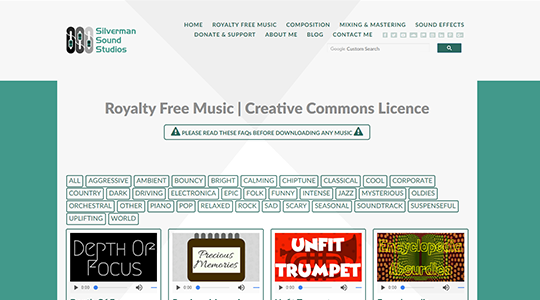 You can browse through almost 100 free songs in various genres — all of them being offered under the Creative Commons Attribution 4.0 International License. While it’s great to have all of this Creative Commons media out there for people to use, finding it can be a whole different matter. Luckily, there are several sites that have come along to ease your pain and help you search for just the right files. While some, such as the Archive.org one, only search their site, their collection is so extensive, it’s still worth including. 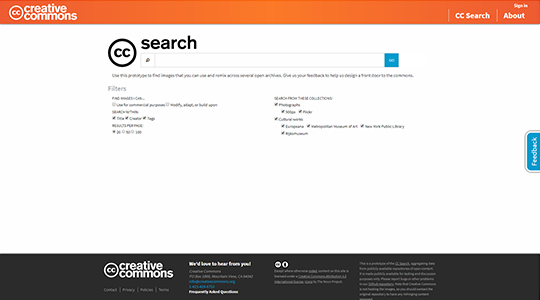 The first stop in a generic CC search should be the search interface provided by the Creative Commons organization itself. While not a search engine in itself, this tool instead connects to various other search engines and resources in order to fetch the best result. 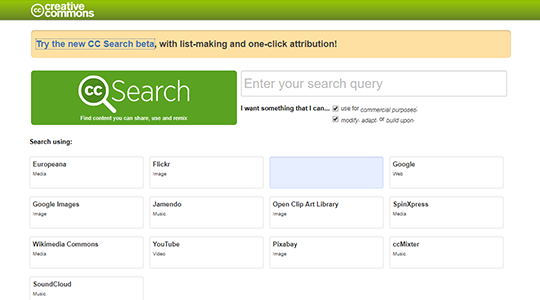 They also provide a beta version of a new tool dedicated only to image search, which you can access at ccsearch.creativecommons.org. 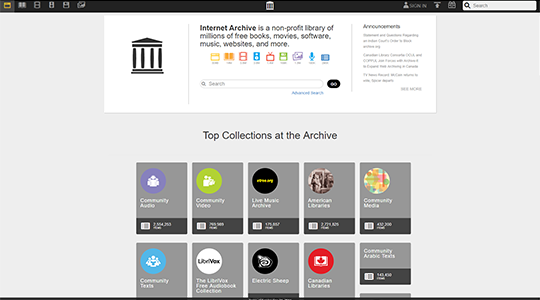 Most people only think of Archive.org for the Wayback Machine, but it also offers up a huge selection of audio, video and text documents under the Creative Commons license. Everyone knows about Wikipedia. 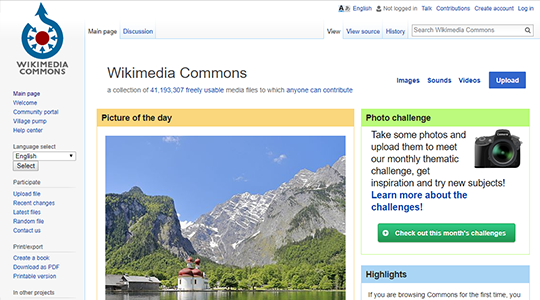 Not that many people know about its Creative Commons section, Wikimedia Commons. This is a collection of over 40 million media files that may be freely reused subject to certain restrictions (in many cases). Be sure though to check the license details for each file to see how you can use it. 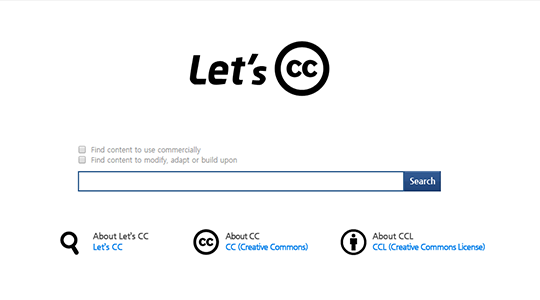 Let’s CC is a Korean website that acts as an interface to search for CC licensed files. It doesn’t have an index of its own, instead using other search engines like Flickr or YouTube. Just like in every other case, make sure to check the license details for each file. 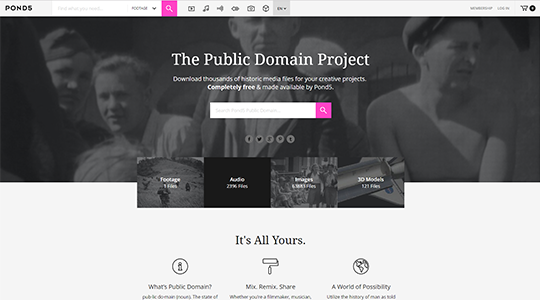 Pond5 initiated the Public Domain Project as a way to make historic media files available for your creative projects. With over 60 thousand files in the collection, it is a place worth checking. Of course, one doesn’t necessarily need a specialized tool to find Creative Commons resources. The same thing can be done using either of the mainstream search engine. No matter if you prefer Google, Bing, Yahoo or something else, add “Creative Commons” to any of your media search query and you should get some good results. Back in 2009, finding free pictures under a Creative Commons license was a fairly daunting task, as most of the market was dominated by the stock photography sites. Fast forward several years and we find that this is the category of resources with the greatest growth. Where our initial list had 10 entries, the updated lineup has over 70 items. This makes the job of selecting 5 featured websites even more difficult, and it’s inevitable not everyone might agree with our pick. A special mention needs to be made to a subcategory of websites — the one author collections. Many photographers have chosen to offer their work under various flavors of Creative Commons license. In some cases, a few people pooled their images together for a larger collection. While the total number of pictures in each of these websites is not that large, you can find amazing shots that won’t be featured anywhere else. 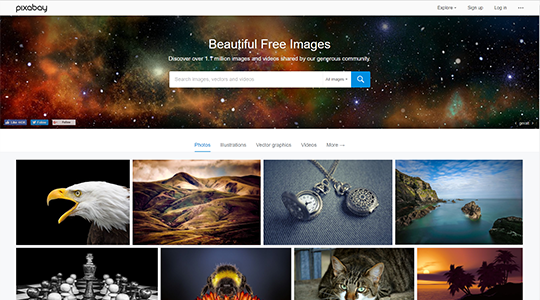 Flickr was, and still remains, the best place to find images licensed under Creative Commons. There are pre-filtered searches for each flavor of CC with results often numbering in the tens of millions. Some of the entries in the list below are powered by the Flickr API. This is definitely the first website you should visit if you’re searching for Creative Commons pictures. Unsplash is, without a doubt, the poster child of the free pictures movement that has taken the internet by storm over the last several years. What started in 2013 as a Tumblr site with 10 pictures leftover from a photoshoot is today a thriving community with over 200,000 images, more daily views than The New York Times, close to 100 million downloads, and partnerships with industry giants such as Apple. 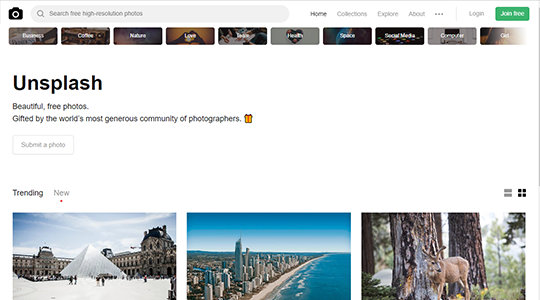 500px is another community portal aiming to replace Flickr, as the latter has been fading out of public interest over the last decade. With over 12 million users, it looks like they can back up their claims. 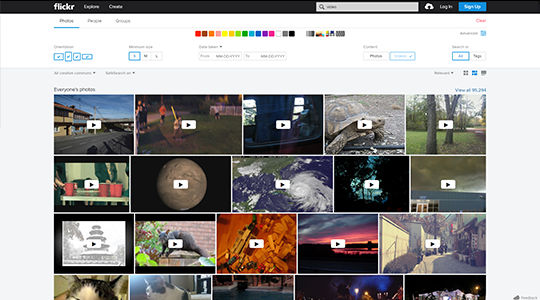 And just like Flickr, they offer similar predefined searches to make it easier for you to find out any images released under Creative Commons licenses. Pixabay is another example of a thriving online community focused on sharing photos, illustrations, vector graphics and videos. 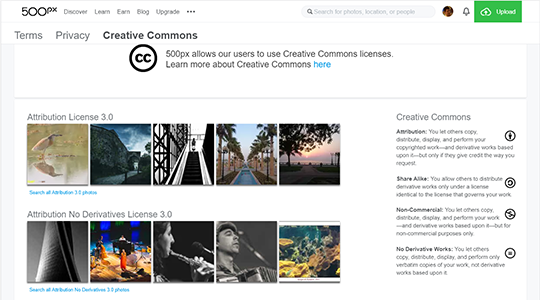 Unlike Flickr and 500px, all content is exclusively available under CC0 — meaning they’re all part of the public domain. All submissions are screened and approved before being admitted, and there’s even an API for all you app developers out there. 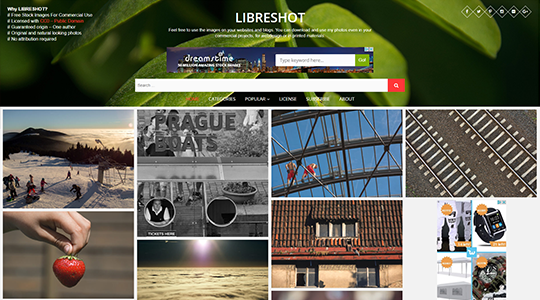 Last of the featured spots goes to Libreshot. We’re dipping here into the growing pool of single-author websites — in this case that of Martin Vorel, from Prague, Czech Republic. There are several hundred pictures available, and you can view the most popular images over the last 24 hours, 30 days or from the beginning of the site. As promised above, we have here a very large list of websites, arranged in alphabetical order. The use of the licensed texts can be a bit odd, but they’re great for pulling quotes and phrases from to go in site headers. 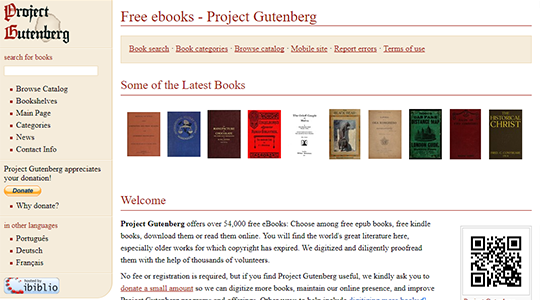 Project Gutenberg started in 1971 and can be safely considered the first digital repository of public-domain content. The philosophy behind the project is to make information, books and other materials available to the general public in forms a vast majority of the computers, programs and people can easily read, use, quote, and search. 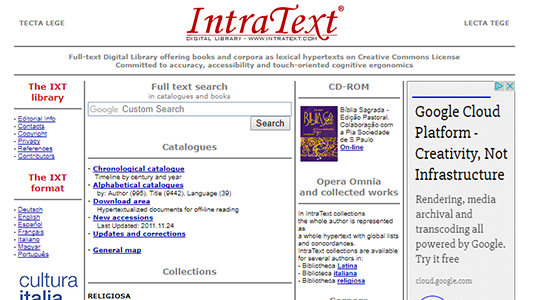 The IntraText library contains over 12 millions texts dating back as far as 900 B.C., and as recent as the 21st century. Make sure to check what license is used for each resource individually before using it. 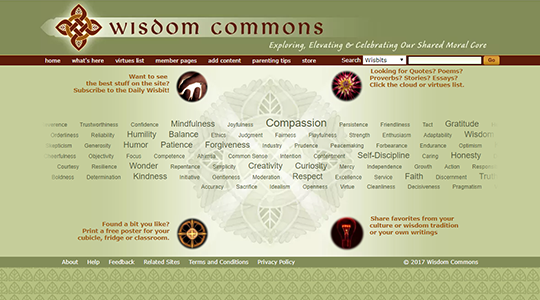 The Wisdom Commons is a place to find and discuss information about virtues that human beings generally agree are important — like generosity, compassion and courage, and so on. This is backed up with several thousands quotes, poems, fables, essays and other similar works that are all free to use. 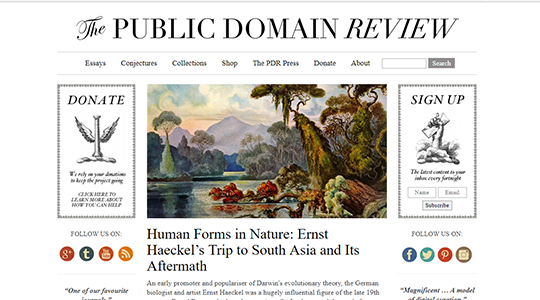 The Public Domain Review is an online journal and not-for-profit project dedicated to the exploration of curious and compelling works from the history of art, literature, and ideas. 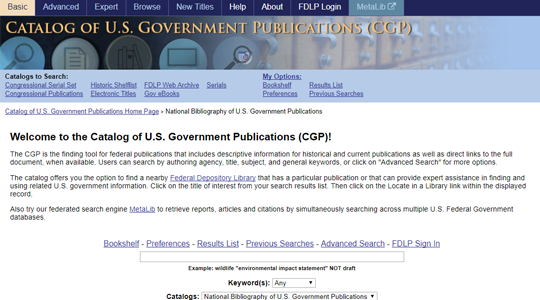 The CGP is the finding tool for federal publications that includes descriptive information for historical and current publications as well as direct links to the full document, when available. Users can search by authoring agency, title, subject, and general keywords. Just as before, here are some other websites leading to lesser-known caches of public domain and creative commons texts. More and more of the web is turning to video, and online video viewing has hit an all time high. Nowadays, there’s a very large demand for quality stock video that’s free to use without paying a fortune for the right to do it. If you find yourself needing such videos, here’s where you should start searching. Vimeo is aiming to be the second largest video community after YouTube. They back this position with one of the largest collections of Creative Commons licensed videos and by providing the tools to find these videos fast enough to matter. 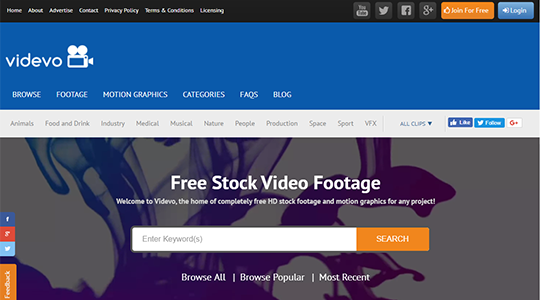 Videvo offers completely free stock video footage and motion graphics for use in any project. It boasts a collection of around 6000 clips and more are added every day. But be sure to check all the details of the license before you use the clips. 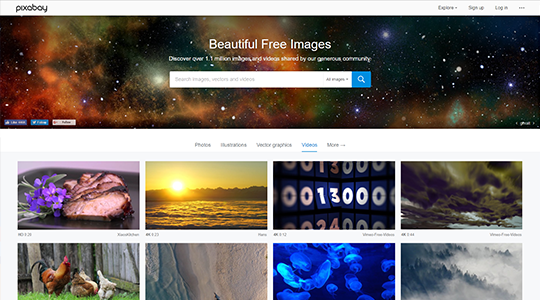 We’ve featured Pixabay in the Images section and for good reason. We’re mentioning here again as it also boasts a great collection of video clips in HD and 4K resolution. This list of featured websites must include Flickr and its over 95,000 videos licensed under Creative Commons. While most of them are amateur home made clips, you can find some hidden gems to use in your projects. 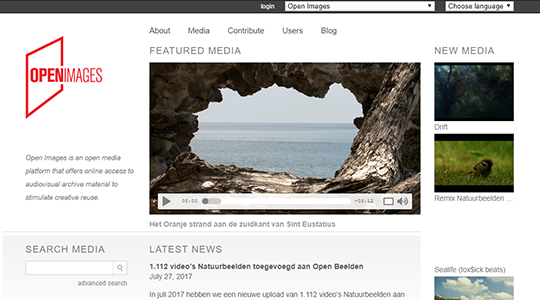 Open Images is an open media platform that offers online access to audiovisual archive material to stimulate creative reuse. Open Images also provides an API, making it easy to develop mashups. Access to the material on Open Images is provided under the Creative Commons licensing model. 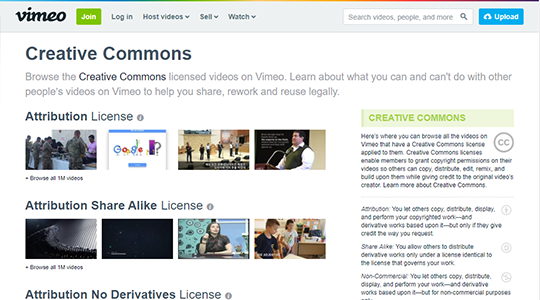 Here are some more places where you can go searching for creative commons licensed video clips. Here we are at the end of our journey, with a huge list of new places to search for various Creative Commons resources. Hopefully this will make it a lot easier for you to find the right media for your projects.